Introducing… Charlotte’s new Toybox personalised baby blanket. This new design was inspired by nursery toys and Charlotte’s own happy memories of childhood. 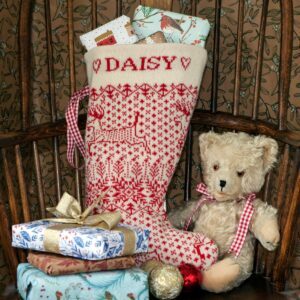 The knitted motifs include rows of colourful building blocks, dolls, toy soldiers and little dolls houses – toys which have an enduring quality and are still popular today. 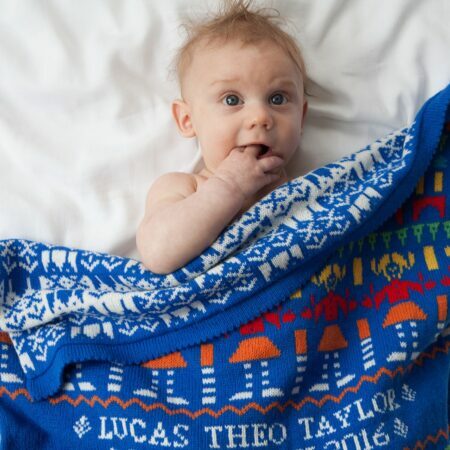 Baby’s name and date of birth are knitted across the middle of each blanket – making for a very special baby gift and a colourful addition to a new baby’s nursery! Charlotte enjoyed playing with the colour combinations for these bright and cheerful blankets – and settled on three different colourways – Carnival, Festival and Parade. 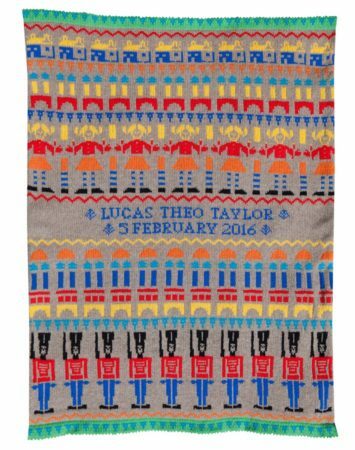 The “Carnival” colourway has a bright blue background, with the motifs knitted in bold red, yellow, orange, turquoise, white and green. 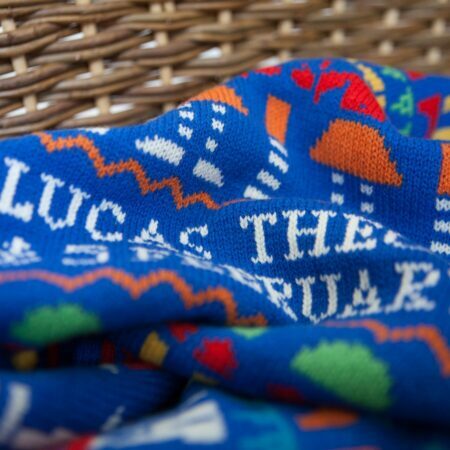 The “Festival” colourway is knitted in a calm sand colour with colourful red, turquoise, orange, blanket, green and royal blue. 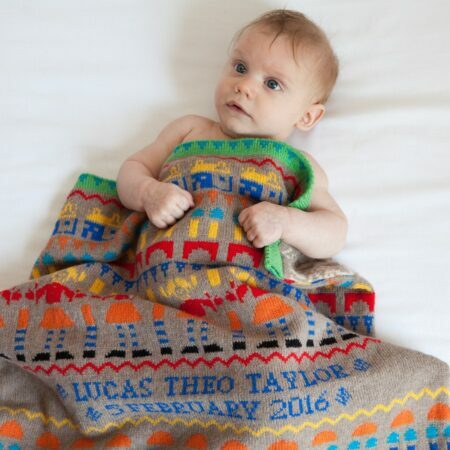 The “Parade” blanket is knitted in taupe, with red, turquoise, orange, black, yellow and royal blue. It is finished with a beautiful green picot edging. All three Toybox blankets are knitted in lambswool, which is lighter than the merino wool used to make Charlotte’s Animals & Flowers and People & Trees personalised baby blankets. You can find the new Toybox blanket alongside the merino wool blankets on Charlotte’s website here. As with all Charlotte’s baby blankets, each one is individually knitted to order in her Norwich studio. 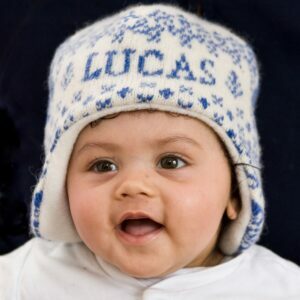 Baby’s name and date of birth are knitted as an integral part of the blanket. 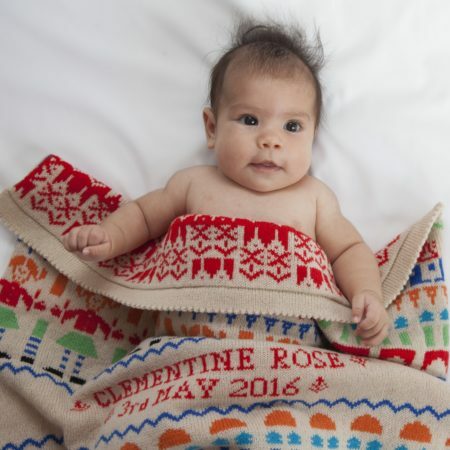 Each blanket has a knitted front and back (the back is knitted in a complimentary geometric design, in two colours) and beautifully finished with a picot edging. Each blanket arrives gift wrapped in a muslin bag, tied with ribbon, ready to give to the new arrival!